The World Economic Forum estimates that digital transformation will generate over $100 trillion in value by 2025. Little wonder then, 22% of CEOs are leading digital programs at their companies. IT teams will need to step away from nuts and bolts infrastructure management to optimize digital services that advance their CEO’s agenda. Digital transformation requires the right set of operational insights for business model transformation and optimal customer experiences. Enter Service Intelligence, the ability to decode digital interactions and drive intelligent responses for critical events. How do IT teams manage the health and performance of digital services across their enterprise? Service intelligence requires insights and recommendations from a whole host of IT management tools. Discovery, Monitoring, Event Correlation, Alert Notification and Ticketing tools are the foundations of digital operations. Figure 1 - Service Intelligence Needs Insights From Multiple IT Management Tools. Discovery. How do you gain a handle on your hybrid workloads? How can you map underlying infrastructure to digital services? Discovery tools deliver service health views with network topology models or through configuration item data stored in a CMDB. Monitoring. Once you’ve discovered your IT assets, how do you ensure visibility and control for traditional and cloud-native workloads? Infrastructure, network and application monitoring tools help track the uptime and reliability of your critical IT services. Event Correlation. How do you keep up with monitoring alarms for all the business services your support? Event correlation tools help you weed out false positives and manage incidents with the right context. Alert Escalation. How do you notify subject matters experts during an outage without having to figure out shift schedules and communication preferences? Alert escalation tools notify the right individuals in your domain teams for faster mean time to restoration. Service Desk. How do you coordinate the incident response across different groups? Ticketing systems help you restore services quickly with workflows for incident identification, prioritization, and response. What if you could instantly gain superpowers with a single, powerful solution built for modern digital operations? If you’ve been searching for an intuitive, cloud-based and easy to deploy solution geared towards digital services, your wait is finally over. OpsRamp’s Unified Service Intelligence combines the best of monitoring and alerting for actionable service intelligence. 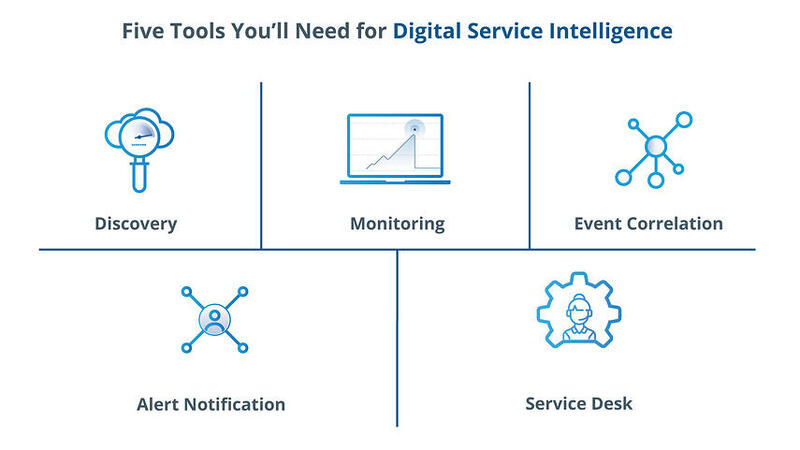 Instead of dealing with different tools, Unified Service Intelligence delivers all the service-oriented management capabilities you need in one solution. It’s the view of IT services you always wish you had. Figure 2 – Unified Service Intelligence: Service Made Smarter. Service Availability and Performance Management delivers a powerful combination of discovery, native monitoring, dynamic service maps and service health dashboards for handling your digital footprint. A whole host of integrations with commonly used platforms and tools ensure access to KPIs of your digital services in one place. Keep Up With Your Business Services. Policy-based discovery automatically finds your IT assets and applies the right monitoring frameworks without manual intervention. Gain oversight and control over hybrid workloads with unified asset visibility. Drive Business Resilience. Auto-assign best practice monitoring templates during onboarding for your digital services. Manage infrastructure availability with the right set of metrics and key performance indicators. Enable a Business View of IT. Service maps help you extend beyond infrastructure management to understand dependencies for your business services. 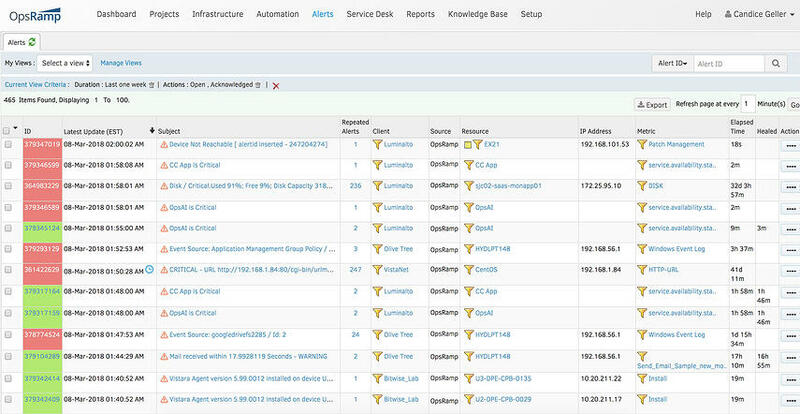 Drive situational awareness with service views for all your workloads. Stay Connected With All Your Tools. Best of breed integrations with leading platforms and tools offer you choice and flexibility. Whether you use Linux, Cisco, AWS or Azure on the platform side or BMC, New Relic, ServiceNow or SolarWinds on the tools front, we’ve got you covered with our custom integrations and APIs. Stop Managing Infrastructure, Start Managing Services. Role-based service health dashboards allow business and IT leaders to analyze and track the health of macro and constituent services that they care about. 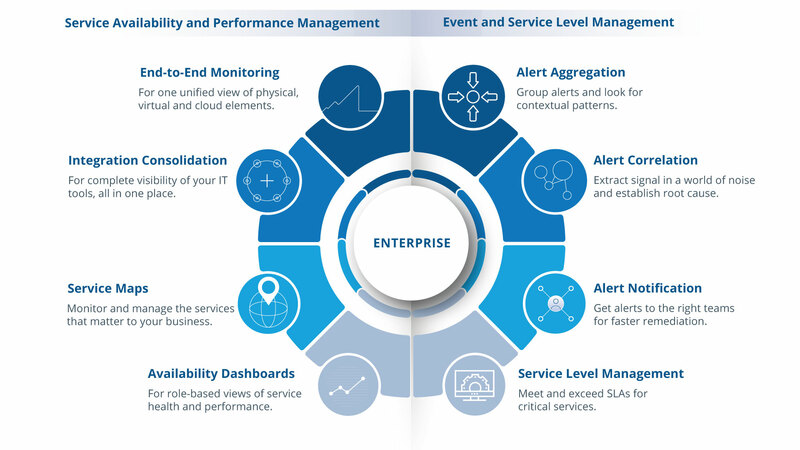 Event and Service Level Management offers all that you need for incident management in the form of event correlation and alert notification features. You'll also have access to a robust service desk for managing your incidents, from start to finish. Gain Contextual Visibility. Focus on the alerts that matter by consolidating your alerts into a smaller number of manageable incidents. Drive faster remediation by prioritizing alerts with the right context. Stop Drowning In Alerts. Cut down noise by analyzing and grouping incoming alerts based on incident type. Reduce alert fatigue and establish root cause with intelligent alert correlation. Streamline Incident Collaboration. Policy-based alert escalation notifies the right subject matter experts during an outage. Reduce mean time to resolution by routing alerts using shift rosters and escalation matrices. Restore Your Services To Normal. Drive faster resolution with native service desk capabilities. 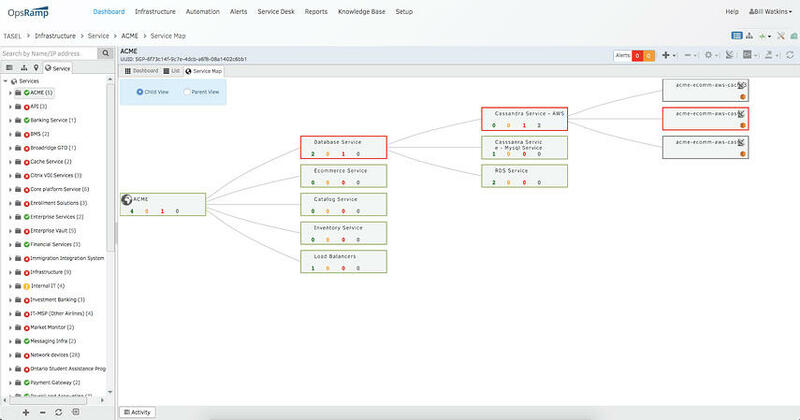 Enable incident support using bi-directional integrations for ITSM tools like BMC Remedy or ServiceNow. What Changes Now With Unified Service Intelligence? With Unified Service Intelligence, it’s time to rewrite the old rules of IT management. Over the last few years, we’ve seen enterprises adopt cloud-native services, recruit DevOps and SREs and embrace continuous delivery for agile operations. While it’ll be a while before most enterprises transition to service-oriented management, Unified Service Intelligence is here to handle your legacy and modern services in one place. The old rules of IT management are fading into the rear-view mirror. Embrace the new rules of service intelligence to drive digital business operations at the scale your CEO demands. 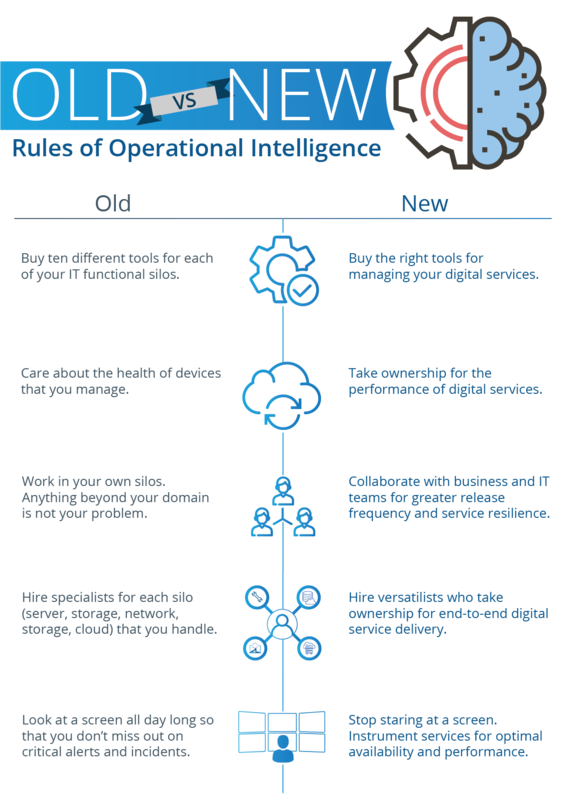 Figure 3 – Old Vs New Rules of IT Operational Intelligence. Learn more about OpsRamp Unified Service Intelligence. Watch this video to see the OpsRamp platform in action. Contact Us to get started with OpsRamp today!